Posts about how to do things the way I do them. The STATA’s command –capture- allows you to check if the file that you are trying to open exists. This command evaluates whether or not the file is in the folder you are using. Then, –capture- assigns a value to the macro _rc depending on whether the file is in the folder or not. Therefore, we can use the value of _rc to continue with our STATA’s script. This entry was posted in How To, STATA and tagged howto, STATA, STATA/capture, STATA/forvalues on March 5, 2013 by Francisco Morales. This entry was posted in How To and tagged google reader, howto on February 26, 2013 by Francisco Morales. Some people enjoy reading on paper not only because they can make annotations and highlight text easily, but also because they actually like their handwriting. If you are not one of those, then the following guide may help you. I will show how to extract all the highlighted text and the annotations from a PDF using Acrobat Professional. I did an extensive research (i.e. I tried many different keywords in Google!) before understanding how to extract the annotations from a PDF file. I did not find too many useful articles on the internet. It turned to be an easier process than what most of the site I visited described, so I hope that Google ranks this page well! This entry was posted in How To and tagged howto, MS Word, pdf on October 18, 2012 by Francisco Morales. 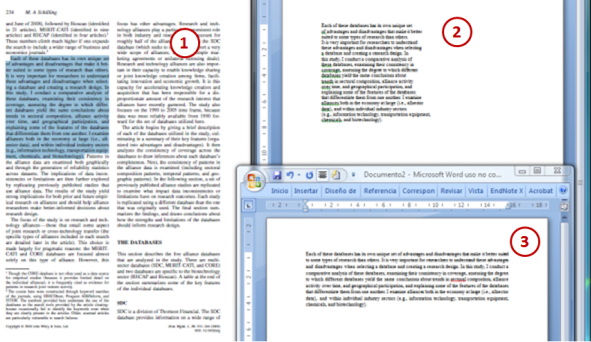 When you copy a paragraph from a PDF file organized in two columns, similar to (1), and paste it into MS Word, you get something similar to (2). How can you get a normal paragraph without those ugly line breaks and get something similar to what is shown in (3)? This entry was posted in How To and tagged howto, MS Word on September 28, 2012 by Francisco Morales. From time to time I discover interesting articles in Google Reader. I mark with a start those articles that I want to read later or store for future re-reading. Since I use Evernote to organize my notes, I was happy when I found that you can setup a simply process to send the starred items in Google Reader to your Evernote account. That is what IFTTT can do for you. If “an item is starred in Google Reader” then “send it as a new note in Evernote”. You can find a lot of recipes already created in IFTTT, so you may want to take a look at its website. This entry was posted in How To and tagged google reader, howto on September 26, 2012 by Francisco Morales.